Call me crazy, but I really do love running on my TM. 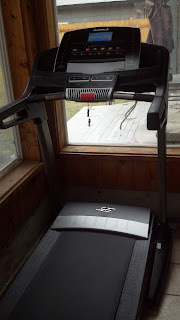 I know, some people call it the “dreadmill” and want to scratch their eyeballs out after only a couple of miles, but there are some great advantages too! I am busy and wished that I had a couple more hours in the day to accomplish everything on my “to do” list. Thankfully my TM is in our sunroom. That leaves me with ZERO excuses. I don’t even have to drive to the gym to use it! Unfortunately I have to go to this thing every day that people call a J-O-B. I have to be there early which means if I need to run in the morning it is still dark outside. Me being the total scaredy cat will not run when it is dark outside. Who knows what creepers are lurking in the bushes?! Enter the TM. 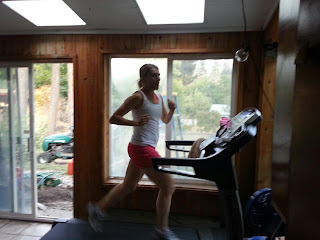 I completed a lot of my hard workouts for CIM and Eugene on my TM. I completed all of my long runs outside and 99% of my tempo runs outside too. A lot of my track workouts (200, 400 & 800 repeats) were completed on my TM. Technically I could do this on my TM, but I haven’t broke down and bought the iFit card….yet. It is definitely something I want to get because I can download a course from Google Maps and it will transfer to my TM. Someday I can say that I ran 5 miles in Central Park while living in another state. I live in Spokane where the winters can be a little sketch. We get snow, ice & freezing rain from October-March (sometimes April). I am generally pretty tough and will run in most conditions, but when there are 6 + inches of snow on the ground I really don’t want to be hoofing through it. Enter my beloved TM. When I first started to resume running after being diagnosed with Compartment Syndrome running on the road caused me pain. However, I could run on the TM and adjust the……..and could run with less pain. Are you fan of the TM? 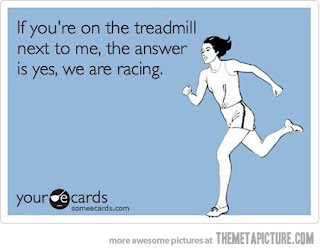 Do you feel like you are racing the person next to you on the TM at the gym? What is the longest TM run/workout you have completed?